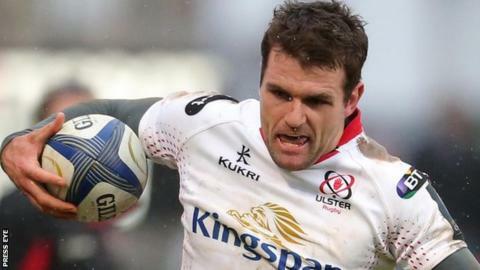 Jared Payne has committed his future to Ulster and Irish rugby by signing a two-year contract which will keep him at Kingspan Stadium until June 2018. Payne becomes the 15th player tied to a central contract with the IRFU. The 30-year-old New Zealand-born back joined Ulster in 2011 and won the first of his 12 Irish caps in November 2014. "It has been an honour for me to not only pull on the Ulster jersey but to represent Ireland," said Payne, "there is plenty for us to achieve". After making the move from Auckland Blues, Payne made his debut for Ulster against the Cardiff Blues in September 2011 and has represented the province 63 times, scoring 14 tries. Jared Payne has been capped 12 times by Ireland since making his debut in 2014. He qualified for Ireland under the three-year residency rule in 2014 and made his debut against South Africa in the autumn, scoring two tries to date in his international career. Ulster's Director of Rugby, Les Kiss, said: "Jared is an incredibly astute and intelligent rugby player". "He adds experience and calm to any backline and will continue to be an important player for Ulster for years to come." Although he has played most of his rugby for Ulster at fullback, Payne is regarded by Ireland coach Joe Schmidt as the natural heir to Brian O'Driscoll's number 13 jersey and has forged a successful midfield partnership with Connacht's Robbie Henshaw. IRFU Performance Director David Nucifora said: "Jared has illustrated his ability to compete at the highest level and be an important leader and decision maker for both Ireland and Ulster". "We are delighted to have secured his services for a further two years."